Sonchiriya is an entire mood within a movie, feels Sukanya Verma. In Hindi cinema's grossly glamorised portrayals, dakuS are either rifle-totting, horse-riding Robin Hoods dispensing justice or brutish plunderers going after wealth and women. 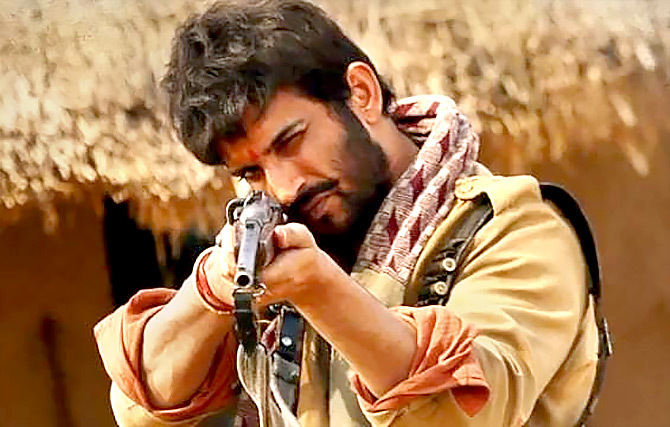 That they could be damaged individuals bound by a code whose skewed morality and dangerous demands are gently corroding their souls is what makes Abhishek Chaubey's Sonchiriya one of the most fascinating takes on the subject. His stark, steely, stirring insights into Chambal's dacoit community examines the cost of dharma and daredevilry through the prism of psychological flux. Ideology is a dangerous beast. Its inflaming presence can ignite a revolution against tyranny, but eventually when disenchantment sets in, the violence will wear off, the spark will burn out and a man will seek closure over conflict. These outlaws or baaghis (rebels), as they address each other, are resentful products of a failed system and dead duck promises made by people in power. When a character quips, 'Sarkari goli se kaunu mare hai? Inke toh vaade se mare hain sab -- behno aur bhaiyon,' it's coming from a place of long harboured indignation. There are no horses, no mutton (not much anyway) and certainly no mobile phones. The weight of rifles and rounds of bullets is burdensome to bear. The dead snakes on land and hungry crocodiles in water carry signs of doom and danger. It is a dreamless existence, ambling from one dusty corner of the ravines to another, escaping cops and questioning the glory in it all. Humour is their sole source of survival. If one faction of this group (Sushant Singh Rajput) is looking for redemption, another (Ranvir Shorey) is stuck in the rebellion rut. The year is 1975 and Indira Gandhi's declaration of a state of Emergency reverberates across the radio even as a band of baaghis announces its unwelcome arrival at an unsuspecting wedding. The pack's leader Man Singh (Manoj Bajpayee) -- in a clever nod to his character from Shekhar Kapur's Bandit Queen -- follows a polite protocol and seems sincere in his desire for minimum causalities. Though he is far removed from the ways of ghar-grihasti, he is respectful of rituals and customs. Chaubey and his writer Sudip Sharma throw in a quaint gesture to underscore it nicely. But Sonchiriya has no time to make nice. Its minefield of volatile impulses and brewing unrest comes alive in Sharma's meticulous screenplay; Meghana Sen's watchful editing, Benedict Taylor and Naren Chandavarkar's Morricone-evoking background music and Anuj Rakesh Dhawan's immersive, superlative camerawork at every step of its relentless chase between outlaws and cops. On the run, the rebels -- still processing the losses they have incurred -- come across a chance to redemption. When we first meet Indumati (Bhumi Pednekar) she is multitasking between a girl, ghoonghat and a gun. It's a solid introduction to her spirit and story that unravels gradually but hits most hard. Women are treated as a liability by movies of this genre, but Indumati is both a carrier of and catalyst for conscience. Entrusted with the reason why the movie is named Sonchiriya in her care, Indumati represents a strength that will take any number of blows to protect her beliefs and do the decent thing. The extent of sickening patriarchy she encounters forms a significant core of Sonchiriya's socio-political commentary. Often, Sonchiriya's narrative draws parallels between nature's food chain and hierarchy of India's woeful caste system. How it colours minds making them unable to judge anything outside its diktats is most conspicuous when it drives a wedge between Thakur-Gujjar colleagues. Sonchiriya is an entire mood within a movie. One that is bleak and inaccessible -- and not always because the language spoken is thick Bundelkhandi -- until you see the craft in it. Sushant Singh Rajput's understated turmoil and compassion perfectly captures the guilt and fatigue of a man fighting apparitions and seeking salvation. The little vulnerability he preserves amidst the grime is the heart of Sonchiriyas's meditative madness. Once again, Bhumi Pednekar proves her mettle in playing characters defined by integrity and nerve. Bajpayee's wisdom and wit sets the tone for Sonchiriya's allegory on moral ambiguity and atonement. Ranvir Shorey's gruff show of obstinacy and belated realisations hits all the right notes. Ashutosh Rana's silently simmering rage, linked to a massacre most unfortunate, is one of his most effective performances in recent time. Will Bhumi and Sushant score with Sonchiriya?